This paper was presented at the FIG Congress in Istanbul, Turkey in May 2018. The paper focuses on the 6.7 km Immersed Tunnel that links Hong Kong to the east, and Zhuhai and Macao to the west. For the construction of such a long immersed tunnel, particular care should be taken in the perspective of geodetic control.The paper describes the design and implemention of the geodetic basis and hierarchical surface control networks. The immersed tunnel which is composed of elements has drawn more attention nowadays because of new advancements and developments. The elements are prefabricated somewhere else and floated to the tunnel site to be sunk into the prepared trench. Each element must line up exactly for the watertight gaskets to seal properly. The HZM immersed tunnel, a key part of the Hong Kong-Zhuhai-Macao Bridge (HZMB) that crosses the Pearl River Estuary and links Hong Kong to the east, and Zhuhai and Macao to the west, is 6.7 km long, one of the longest immersed tunnel ever realized in the world. For the construction of such a long immersed tunnel, particular care should be taken in the perspective of geodetic control. This paper described the design and implemention of the geodetic basis and hierarchical surface control networks. And to decrease the influence of lateral refraction and to improve the configuration strength and increase the number of redundant observation compared with traverse, the design of underground surveying network named duo-linear joint chain and the results of gyro checks are presented. In the end HZM immersed tunnel surveying data is analysed and the performance of the control networks is demonstrated. When it comes to a large cross-water passage, people always think of a bridge or a bored tunnel. However, the attention has now been attracted by a competitive alternative, the immersed tunnel, because of its rapid advancements and developments (Chen 2002). The immersed tunnel is composed of elements, prefabricated on shipways, in dry docks, or in improvised floodable basins, sealed with bulkheads at each end and floated to the tunnel site to be sunk into the prepared trench and linked together (Chen 2002, Yanning and Gang 2007). Immersed tunnels lie only a short distance below water bed level compared with high bridges or bored tunnels. The overall length of crossing can therefore be relatively shorter. Immersed tunnelling involves more operations that can take place concurrently or overlapping, resulting in a more robust project planning and more cost effective (Lunniss and Baber 2013). The Hong Kong-Zhuhai-Macao Bridge (HZMB), crossing the Pearl River Estuary and linking Hong Kong to the east, and Zhuhai and Macao to the west, is a combination of bridges, a tunnel and artificial islands. This crossing consists of three parts, the offshore bridge and tunnel (the Main Bridge), the three boundary-crossing facilities (BCFs) in Hong Kong, Zhuhai and Macao, and the link roads into the three regions. The island and tunnel section, a key part of the Main Bridge, includes two artificial islands and an immersed tunnel. This section is 7440.546m in length, of which the immersed tunnel is one of the most challenging constructions of its kind undertaken in the world to date. With a length of approximately 6 km and a depth of about 44 m (tunnel bottom) below sea level, the immersed tunnel is the longest and one of the deepest ever realized in the world. The longitudinal section of the immersed tunnel is shown in Fig. 1. The standard elements (180×38×11.4 m) for this project are currently the largest ones (Hu et al. 2015, Zhigang et al. 2016). The tunnel element is towed to the work-site for installation and connection to the previous one. The tolerances involved in the process are tight. Each element must line up exactly for the watertight gaskets to seal properly, which is performed under precise control networks, including hierarchical surface control networks and an underground surveying network. As required, the relative precision between two adjacent elements is better than ±35mm and the absolute precision of each element position is better than ±50mm in Hong Kong-Zhuhai-Macao (HZM) immersed tunnel, regardless of the distance to the portal. And it is important to note that, unlike other kinds of tunnels, where alignment at breakthrough is most critical, for immersed tunnel each element has the same precision requirement. There must be meticulous geodetic network design, careful field surveying and rigorous data processing for such high precision requirement. This paper discusses the geodetic basis and networks design of HZM immersed tunnel. This paper is organized as follows. First, the realization of the geodetic basis, the foundation of all other surveying work, is described. Next, how hierarchical surface control networks, the primary global positioning system (GPS) network and the densified GPS network, were built are presented. Third, the influence of the lateral reflection is discussed; the underground surveying network named duo-linear joint chain and gyro checks are presented. Fourth, the measured data from HZM immersed tunnel is analyzed and the breakthrough result is given. Finally, conclusions are described. The geodetic basis including a three dimensional reference system, two independent plane coordinate systems (Bridge and Tunnel Coordinate System, BCS2010 and TCS2010), a height system, coordinate transformation parameters connecting to the different reference frames of Hong Kong, Zhuhai, Macao and the two independent plane coordinate systems is designed. HZM link reference system is realized by the ITRF2005, at that time the most accurate realization of the ITRS. Three continuously operating reference stations were established around HZM link in 2010, the purple triangles as shown in Fig. 2. GNSS data were collected after the establishment of the continuously operating reference stations. 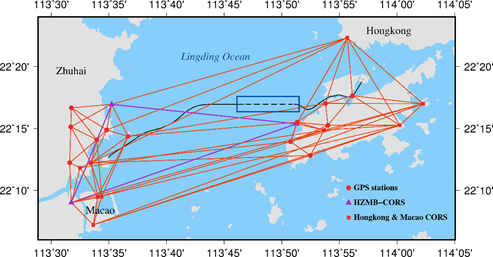 Data from seven Hong Kong & Macao continuously operating reference stations and nearby stations of the network of the International GNSS Service (IGS) was included when data processing. IGS stations with coordinates in the ITRF2005 were used as reference stations. Therefore, the ITRF2005 was introduced into the project area and the three dimensional reference system was established for HZM link. Then the project ellipsoid was constructed. Based on the reference system, the reference ellipsoid should approach the mean elevation plane of the bridge or the tunnel as closely as possible after ellipsoid transformation. The ellipsoid parameters are the same as the parameters of WGS-84 ellipsoid. The geodetic coordinates and 3D rectangular coordinates were calculated based on the project ellipsoid. The central meridian of the project was regarded as the central meridian. The compensation height surfaces of the bridge and tunnel are taken as the projective plane of BCS2010 and TCS2010 respectively. In independent reference systems the projection length distortion can be controlled within ±5mm/km. The coordinate system currently used is Beijing 1954 in Zhuhai, HK 1980 in Hong Kong and Macao independent coordinate system in Macao. The seven-parameter transformation is used to transform the coordinates between different three-dimensional Cartesian coordinate systems. The seven parameters were calculated with at least three points whose coordinates were known before and after the transformation. The coordinate transformation between different plane coordinate systems adopts four-parameter transformation. To obtain the parameters, no less than 2 points in both systems are needed. The design of the primary control network, as shown in Figure 2, consists of 24 GPS stations, including static GPS stations and continuous reference stations, nine distributed in Zhuhai, four in Macao and eleven in Hong Kong. The primary control network began to be established in 2008. During the engineering construction period, the primary control network is repeat surveyed yearly. It is observed using dual frequency receiver according to the requirements of Chinese specifications for global positioning system surveys Class B and processed using the IGS precise ephemeris. The maximum length of baselines is more than 40 km. The primary control network is designed to control the overall HZM link project. After the primary control network was established the densified control network as its densification was constructed. Two artificial islands were designed for the transition between the bridges and the tunnel (Fig. 3). Each island is approximately 625 m long, less than 200 m at its widest point. The islands were completed in 2011. The area of the artificial islands is very complex from a geotechnical point of view. Large land reclamations in combination with ground improvements are carried out close to different periods of the project program and a considerable mutual influence (Hu et al. 2015). Due to the large reclamations in the area of the islands significant settlement and displacement can be expected and will develop with time (Guangqing et al. 2016). An offshore measuring platform was built at about 300 m north of each artificial island. The difficulty of finding stable location for stations has resulted in the development of a strategy for densification of the primary control network. Control points are established in the artificial islands and changed as the engineering conditions except two points in each platform. The points are distributed in such a way that they provide good positional and azimuthal control convenient to project implementation. The densified network is measured by means of GPS, repeating survey every three months and check survey every month, shortly before the start of the transfer survey from surface ground into the immersed tunnel, with the same amount of GPS receivers as stations and adequate duration. The densified control network when 7th repeating survey is shown in Fig. 4. It comprises fourteen points deployed in the artificial islands and measuring platforms. The red triangle points in platforms are measured together with the primary control network to obtain their engineering coordinates and are initial points of the densified network. The distance between two adjacent points is from several meters to more than seven kilometers. According to the results of repeating surveys and check surveys, the relative horizontal positional accuracy in the network is less than ±2mm at the 99% level of confidence. HZM tunnel immersed part consists of 33 tunnel elements, of which most have a length of 180 m. The cross-section of the immersed tunnel is shown in Figure 5, which comprises two traffic bores and one utility gallery. The typical outer dimensions are 37.95 m × 11.4 m (Zhigang et al. 2016). There is good inter-visibility between the two bores because of the escape doors in every element, as shown in Fig. 6.The immersed tunnel section measures 5664 m, the cut and cover tunnel sections on the artificial islands 163 m and open ramps on the islands 355 m, making the total tunnel length equal some 6.7km. The tunnel construction began at the west island direction from the element E1 to E29, then at the east island direction from the element E33 to E30. The closure joint is between element E29 and E30. The length of west section from the portal to closure joint is approximately 5.5 km, of east section approximately 1.2 km. In each section an underground network must be built. The main systematic error source inside the tunnel is the influence of lateral refraction (Velasco-Gómez et al. 2016). A considerable gradient of temperature in the direction perpendicular to the axis of the tunnel may be produced by the heat transferred from the seawater. The gradient of temperature depends on many factors, such as the depth of the tunnel below the sea surface, the type of ventilation system, the thickness of the tunnel wall and the type of the element. It is hard to know the exact values of the gradient of temperature in the immersed tunnels. Theoretically, the gradient of temperature is believed to be axisymmetric in respect to the axis of the immersed tunnel. Therefore, as regard to HZM immersed tunnel, to establish a traverse as close as to the centre line and as far as possible from the tunnel wall or to run a double traverse on both sides of the tunnel with the same off-set distance from the centre line is the easiest way to decrease the influence of lateral refraction (Chrzanowski 1981; Korittke 1990). Based on the above principle, simulations are undertaken to determine the suitable underground control network configuration. The precisions of angles and distances are ±0.5″and ±1mm+1ppm in the simulations and the side length is 720m, the length of four elements (similarly hereinafter). The error ellipses of the traverse and double traverse with common stations are as shown in Fig. 7 (a) and (b). The lateral errors of the last point of the traverse and double traverse are 51.66 mm and 47.21 mm, beyond the immersed tunnel accuracy requirements. Based on the double traverse, each traverse is taken place by the traverse chain to produce a more complicated network, keeping the entire network axisymmetric in respect to the axis of the immersed tunnel, for increasing the precision. The new network is called duo-linear joint chain, as shown in Fig. 7 (c) and (d). Comparing simulations of the new network without and with the distance links between the bores are undertaken and results show that they own almost the same precision of the last points. The lateral errors are 30.19 mm and 30.17 mm respectively. The error ellipses are as shown in Fig. 7 (c) and (d). For the reliability purpose the distance links are suggested. In this case, the traverse chain in each bore can be checked by the one in another bore. 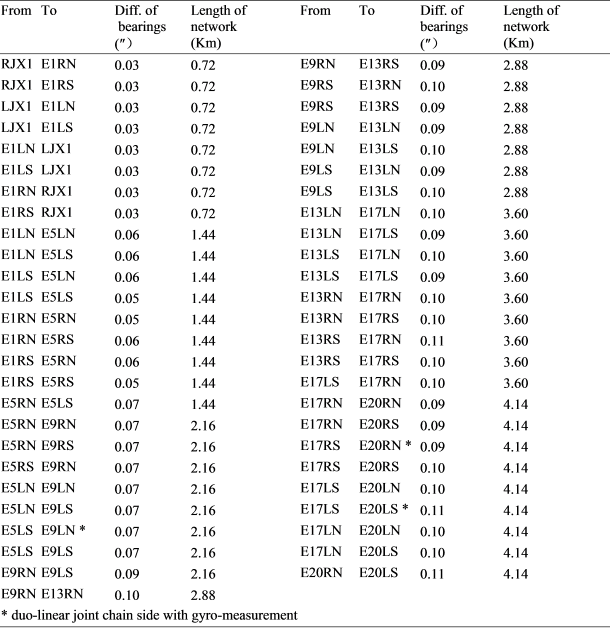 If it is valid that the theorem on the symmetrical distribution of the gradients of temperature, the traverse chains in both bores should be deflected in the opposite directions. That is to say the overall adjustment from both traverse chains should be almost free of refraction error. A length of 720 m of the west network legs is eventually selected after severe pre-analyses and mathematical optimizations of accuracy and a reasonable compromise between tunnel conditions such as station inter-visibility and accuracy requirements. A length of 180 m of the east network legs is selected. Total stations are used for angle and distance measurements. 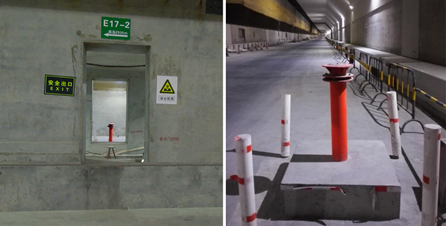 Steel pillars with forced centering plate are installed as permanent underground survey control points (Fig. 6). GYROMAT 3000 is used to make gyro checks and to insure the reliability of results. The gyro checks were made in December 2015. Reciprocal observations with GYROMAT 3000 on same network lines were done. Angle and distance measurements were done using TS30. The length of the underground network was 4.3 km and the configuration is as shown in Fig. 7 (d). The value of the gyrotheodolite constant was established on the sides of the exterior densified control network. 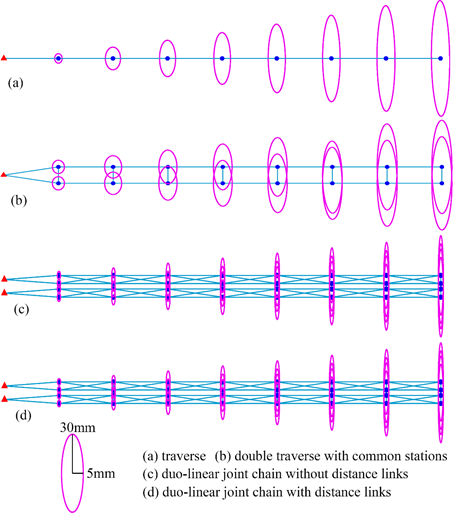 Table 1 shows the differences between the bearings of the duo-linear joint chain after an adjustment of the network with and without gyro observations. The differences between the bearings increase as the length of network become larger. However the magnitude is small. The influence of lateral refraction is decreased effectively by the axisymmetric network. It is permissible to consider that only random errors exist in angle and distance observations. Several years will usually be taken to establish the geodetic networks for a mega project. For the densified control network of HZM immersed tunnel, the first measurement was implemented in November 2012, and the 17th in March 2017. Because significant displacement and settlement have taken place and there are more and more buildings in the narrow artificial islands, the GPS stations in islands have been changed many times so that the stations were not exactly the same every two measure periods. Hence, a principle has been put forward that the underground survey must be implemented instantly after the densified control network survey, particularly the stations that link the ground and underground. where is the estimation of t unknowns, A is the n by t design matrix with rank t, P is the weight matrix, l is the constant vector of n measurements, is variance of unit weight, and are covariance matrix and cofactor matrix which contain all accuracy information of the network. The measured data is processed and analyzed according to different configurations (the duo-linear joint chain and double traverse). The results are shown in Fig. 8. Similar to the simulations, the precision of the duo-linear joint chain is higher than the precision of double traverse. Suppose ratio is equal to , where is the position error of the duo-linear chain point and is the position error of the double traverse. The ratio is smaller than 85% and becomes smaller as the network length increases. The measured positional error of the last point in the underground duo-linear joint is 13 mm, much less than the simulation results shown in Fig. 7. This indicates that the measured data has higher accuracy than the simulation data. It should be predicted that the HZM link immersed tunnel alignment can be controlled well by the duo-linear joint chain. The closure joint was installed in early May 2017. The lateral breakthrough error is 12 mm. It is demonstrated that the design of surface and underground networks is effective. Hierarchical surface control networks, the primary control network and densified control network, are designed and constructed. The network observations are done by GPS techniques. Adequate multiple observations is taken to guarantee repeatability and reliability. The underground surveying network, named duo-linear joint chain, is designed. It has higher precision and reliability with more redundant observations and stronger configuration than traverse. This high-level network can be expanded to other precise engineering projects, including but not limited to other immersed tunnels in construction and in planning. The gyrotheodolite usage is the only method to decrease the influence of refraction for most of tunnels. However, the gyrotheodolite usage can be omitted according to the result of the gyro checks in HZM immersed tunnel. The influence of lateral refraction is decreased effectively by the axisymmetric network. Chen, S.Z., 2002. Design and Construction of Immersed Tunnel. Beijing: China Communications Press. Chrzanowski, A., 1981. Optimization of the breakthrough accuracy in tunneling surveys. The Canadian Surveyor, 35(1), pp.5-16. Guanqing L. and Shengxiang, H., 2016. The breakthrough error estimation of HongKong-Zhuhai-Macau Bridge immersed tube tunnel. Science of Surveying & Mapping, 41(12), pp.10-13. Hu, Z.N., Xie, Y.L. and Wang, J., 2015. Challenges and strategies involved in designing and constructing a 6km immersed tunnel: A case study of the Hong Kong–Zhuhai–Macao Bridge. Tunnelling and Underground Space Technology, 50, pp.171-177. Korittke, N. 1990. Influence of Horizontal refraction on traverse measurements in tunnels with small diameter. Proceedings of the Second International Workshop on Accelerator Alignment. Hamburg, Germany, 10–12 September 1990. Hamburg: Deutsches Elektronen Synchrotron DESY. Lunniss, R. and Baber, J., 2013. Immersed tunnels. Boca Raton: CRC Press. Velasco-Gómez, J., Prieto, J. F., Molina, I., Herrero, T., Fábrega, J. and Pérez-Martín, E., 2016. Use of the gyrotheodolite in underground networks of long high-speed railway tunnels. Survey Review, 48(350), pp.329-337. Yanning, W. and Gang, X., 2007. Application and state of the art of immersed tube tunnels. Modern Tunnelling Technology, 44(4), pp.1-4. Zhigang, Z., Wei, L., Hai, J. and Xiaodong, L., 2016. Layout and Design Techniques of Cross Section for the Large Immersed Tunnel. Procedia Engineering, 166, pp.37-44. Guanqing Li is a Ph.D. candidate of Geodesy and Surveying Engineering at Wuhan University, China. His research interests include precise engineering surveying and deformation monitoring. 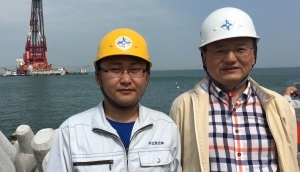 Shengxiang Huang is a Professor of School of Geodesy and Geomatics & Collaborative Innovation Center for Geospatial Technology at Wuhan University, China. His research interests include deformation monitoring and disaster prediction, satellite navigation and positioning technology & precise engineering surveying.